I first saw this book in an airport, appropriately enough. 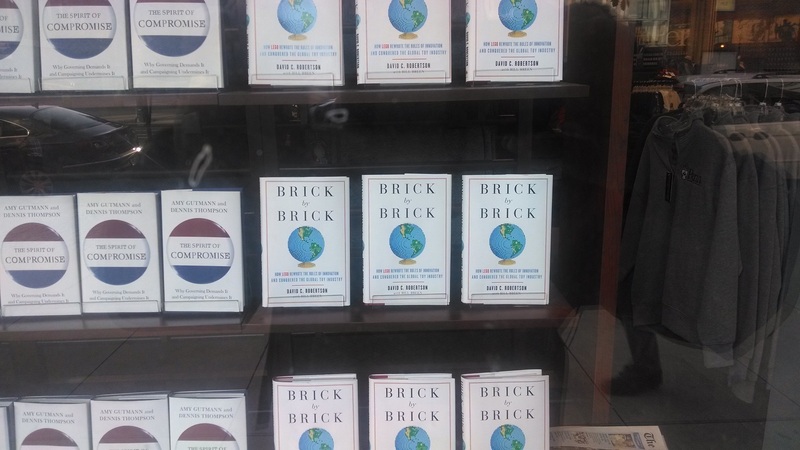 I say that because Brick by Brick describes, among other things, how international businesses have become and also because the book is the kind of business case study you see in airport bookstores around the globe. That last point is actually a caution. I like case studies as much as the next person but I think it’d be more honest to call them case stories because that’s what they are. I’m not disputing any facts or events, but I am also trying to innoculate myself–and you–against the seductive power of stories to create emotional connections that, subconsciously, can make us more favorably inclined to an author’s thesis. Brick by Brick in the window of an airport bookstore. I think it was Philadelphia? So many airports…Taking photos: the new way to keep notes. In addition, case studies are just that: specific examples meant to illustrate a more general principle. While I’m quite intrigued by the concept of N of 1 studies, those kinds of studies are meant to be specific rather than general. For example, when studying people using N of 1 models, an underlying assumption is that any findings may well be unique to that individual rather than the larger population. Maybe once enough data is aggregated broader trends can be detected. What’s particularly fascinating is that LEGO really was on top of cutting edge thinking in the 90s. They were mindful and humble. They wanted to maintain growth and were doing what out of the box thinkers suggested was best–innovate to survive and thrive. However in trying to cover all the innovation touchstones, they made several missteps, perhaps chief of which were veering too far away from what made LEGO unique as a toy and an experience, and disconnecting profit from innovation. While prophets of innovation might suggest innovate first and profitability will flow, the LEGO story provides a meaningful counterexample, embodied by efforts like the Jack Stone figurine. What figurine you ask? Exactly. LEGO also tried to use crowdsourcing, to branch out into related areas like theme parks and television programming, and to build an innovation culture. And yet the result was more or less the famous underpants gnome scene from South Park: 1) Steal Underpants. 2) ??? 3) Profit. Rather than becoming huge new profit engines for the company, many of these efforts pushed the company into the red. By 2003 it was clear that barring a huge turnaround LEGO would go under. The remainder of the book describes the efforts of many, including Jorgen Vig Knudstorp, to turn LEGO around. They undertook a series of moves that arose from the clarity granted by desperation and impending doom. The company started by returning to core values (play themes embedded in “the brick”), ruthlessly cutting programs and staffing to provide financial breathing room, and engaging their retail partners. Once some level of financial stability had been achieved, LEGO started down the path of innovation again, but this time in a very bounded, focused way. If there’s a theme that seemed to resonate throughout this book, it’s that true innovation arises out of constraint. This isn’t a concept unique to this case study and is something worthy of its own post at some point, and it’s also something I touch on in some of my other posts about innovation in Biopharma. As an example, crowdsourcing came back but rather than throwing the opportunity open to anyone, LEGO approached it via working with selected groups of kids, and specific groups of adult hobbyists. The LEGO Mindstorms robotic system, for example, had an extremely devoted adult following, and LEGO chose to access that population by first finding a few key opinion leaders and tapping them, and only gradually allowing more of the community to provide feedback and suggestions. And the final word always rested with LEGO. Other tenets of innovation, such as the exploration of new markets and the practice of disruption, also came around again but this time in a more controlled way. The LEGO architecture series, which were inspired by the work of Adam Reed Tucker, was one such exploration of new markets. LEGO partnered with Tucker to test-drive the market for high-end LEGO models that could be sold to older kids and adults in new retail outlets like museum gift shops. Based on the ubiquity of these kits in the museums I frequent across the US, I’d say that worked. But by starting small, LEGO minimized risk while taking advantage of novel ideas. LEGO also tried their hand at creating a disruptive innovation in the form of a computer game based on LEGO. The idea was to create a massively multiplayer online role-playing game (MMORPG) based on LEGO that would reach many more kids, become a continual revenue stream, and possibly disrupt the physical building process that is at the heart of LEGO. This effort wasn’t quite as successful. The project suffered from perhaps too many fingers in the pot, a naivete about the difficulty of creating a truly engrossing and encompassing online experience, and having the perfect be the enemy of the good enough, among other reasons. Many of which, by the way, are things Clayton Christensen pointed out are the problem with any large, established company trying to create true disruptive innovation. Interestingly enough, Brick by Brick did identify what I think is likely to be the truly disruptive innovation in this area: Minecraft. The Minecraft platform has succeeded in capturing the imagination of millions of users and allows a huge amount of virtual building and open-ended play within what is really quite a simple (and simply rendered) world. Indeed, like many truly disruptive innovations, the actual quality (at least in graphics) is lower than existing products, the price and margins are lower, and the markets are different. And yet Minecraft has grown to the point that efforts such as the Danish Government’s rendering of all of Denmark in Minecraft bricks are both remarkable and par for the course. The book ends with the current state of LEGO, with the company once again among the most respected toy brands in the world and also an admired source of innovation in toys and play. While I remain agnostic about the whether the things LEGO did to turn themselves around are generalizable and causal, there is no denying they did succeed, and other industries seeking revitalization could do a lot worse than ponder if there are lessons to be learned from the Lords of the LEGO Kingdom. *Stories, you know? It’s so easy to create a narrative and the problem is, we have no clear way of assigning causality. So important to keep that in mind. It’s what they say about Big Data. Until we truly have all the data, there could be a question of sampling bias. If we could look at every single toy company ever in every situation of crisis, maybe we’d have a way to evaluate whether the Lego story is archetypal or an outlier. Good story though, and worth thinking about regardless. This entry was posted in Business, Disruptive technologies, Knowns and Unknowns, Randomness, Serious Games and tagged architecture, billund, blue oceans, Brick by Brick, clayton christensen, crowdsourcing, Denmark, Disruptive innovation, incremental innovation, innovation, innovator's dilemma, Lego, lego architecture, mindstorms, minecraft, MMORPG, star wars. Bookmark the permalink. ← The innovators dilemma in biopharma part 3. What would disruption look like?